Wishing you all the health, happiness and wealth. We are sending you much gratitude for all the support and likes, they are well appreciated by all of us. We are here with our post about the eyes, I had a problem that lasted almost two years and came to find that I only needed a small amount of my dedication and some healthy research and it was over. For a while, I was very concerned that my ability to see and work with my eyes as consistently as I do. It was in a period of challenge that I felt was out of my control, not my favorite feeling, with that being said, I started my research and came up with a system that really worked and here I am sharing it with all of you! Enjoy. They are connected to the entire nervous system, Which gives them a special importance. In Taoism the eyes are regarded as yang energy that guides all the chi flow in the body. The different areas of the eyes correspond to different organs of the body so they reveal the health of your entire body: you can tell which organs are weak or toxic by looking at your eyes. Nowadays people use their eyes much more than in the past to read, watch television, and work with computers, other electronic devices, and microscopes. This strains them a great deal and allows much of the energy of the connected organs to be drained out. 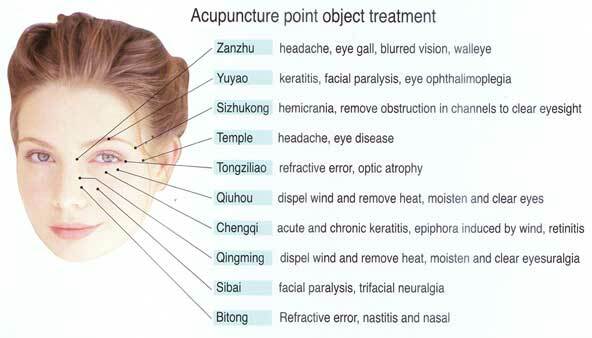 Massaging the eyes will reenergize the vital organs. How do children inherit eye color? Can a child’s eye color be predicted? Why are an albino’s eyes pink? How can two brown eyed parents produce a blue eyed child? Why are my eyes a darker blue than my sibling’s? How are the colors in the iris formed? These are questions one may have wondered from time to time. The answer to all of these question lies in the genes inherited from one’s parents. Different eye colors are produced because of the different amounts and patterns of pigment in the iris. The amount of pigment and the pattern of the pigment is determined by a person’s genetic makeup. The DNA received from one’s parents determines what color eyes they will have. Each human has 46 chromosomes located in the nucleus of the cell. These are divided into 23 pairs of chromosomes. A baby inherits one chromosome from each parent in each pair of chromosomes. A piece of DNA on a chromosome is called a gene. Genes are the basic unit of heredity, they determine many characteristics about a baby. Genes also come in pairs. Alleles are found in genes and determine the appearance of any characteristic. There are two alleles for each trait inherited. If the two alleles are the same then they are homozygous for that gene. If the alleles are different, then they are called heterozygous. One allele is expressed over the other allele. This is called the dominant allele, the unexpressed allele is called recessive. For example, if there was a brown allele and a blue allele, the brown is dominant, so the person would have brown eyes. But not just one pair of genes can control a single trait. Right now there are three known gene pairs that control eye color. The bey 2 gene on chromosome 15 contains a brown and blue allele. Also on chromosome 15, the bey 1 gene is the central brown gene. On chromosome pair 19 the gey gene contains a green allele and a blue allele. A green allele is dominant over a blue allele, and a brown allele is dominant over both green and blue alleles. For the bey 2 gene if a person has a brown allele then they will have brown eyes. In the gey gene the green allele is dominant over the blue allele, but it is still recessive next to a brown allele. For example if a person has a brown allele on chromosome 15, but all the other alleles are blue or green, they will have brown eyes. A green eyed person would have a green allele on chromosome 19 and all or some other blue alleles. Blue eyes are produced only with two blue eye genes. All four alleles must be blue to produce a blue eyed person. Another way of predicting the color of a child’s eyes is to use the parent’s eye color genes. If both parents have a blue and brown gene, their eyes are brown, but if the child inherits the blue gene from each parent then the child will have blue eyes. If the child only inherits one blue gene then they will have brown eyes. The genetics determine what color a child will have, but how exactly does this color form in the eye? Melanin, a pigment also found in the skin, is the substance that produces the eye colors specified by the genes. The amount and placement of the melanin produces the different eye colors that we see. 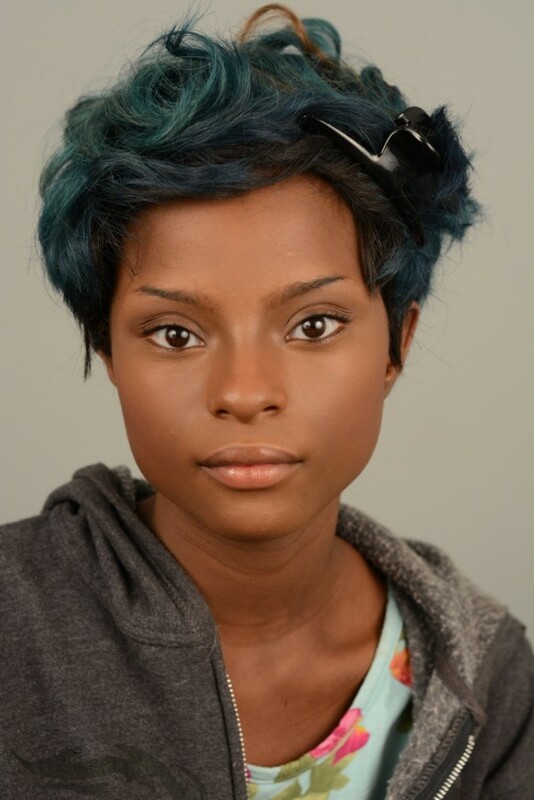 Melanin is a dark brown pigment that is placed in the iris. The more melanin used in the iris means the darker the eye color will appear, the less melanin used means that the eye color will be lighter. The genes tell the enzymes how much melanin to deposit in the iris. A newborn’s eyes appear blue, but may darken over the next few years. Melanin production has not begun at the time of birth. A child’s true eye color cannot be determined until the age of three. 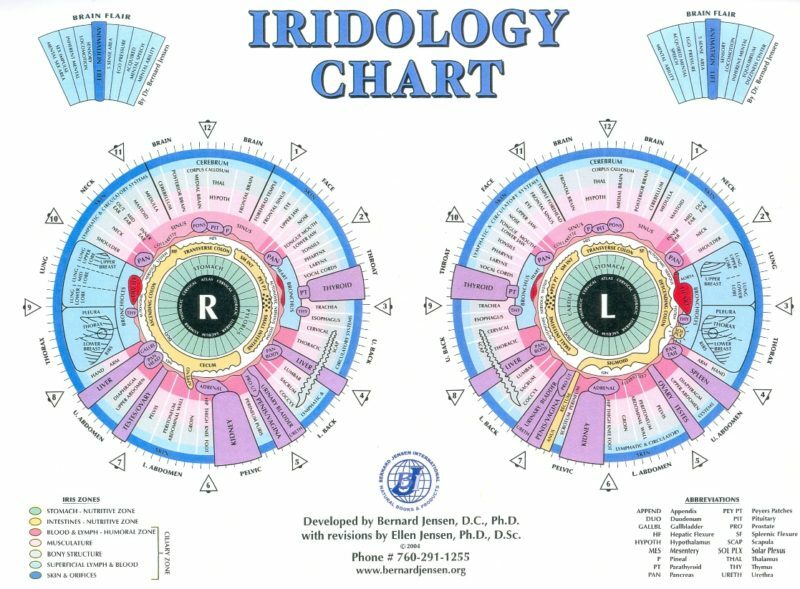 There are two layers to the iris, the anterior and the external, or front and back layers. To produce blue eyes, there is no pigment found in the front layer. The brown pigment melanin is deposited in the back layer only. It appears blue because of reflection and diffraction of light. In green eyes, a small amount of melanin is deposited in the front layer of the iris along with the melanin found in the back layer. The additional pigment to the amount needed for blue eyes, causes the eye to appear green. To produce gray eyes, the dark pigment is distributed in the front layer of the iris and over the blue background it appears gray. In brown eyes there is so much pigment in the front layer, that the blue behind is completely covered up. Some people have so much pigment in the front layer that their eyes appear very dark brown or black. Hazel, blue-green, gray-blue eye colors are produced by different amounts of pigmentation and the pattern in which the pigment is placed. Albino eyes are have no pigment at all in either layer of the iris. The iris appears pink or red because of the reflection of blood vessels in the back of the eye. The pattern in which the pigment is deposited is also determined by genetics. The pigment may be deposited in rings, clouds, radial stripes, or spread over the entire iris. A person’s eye color is determined by the genes inherited from their parents. The types of alleles received from the parents are assigned to certain chromosomes. The dominant genes are expressed and the recessive genes are hidden. In the development of the iris those genes tell enzymes to produce and place a certain amount of melanin in the iris to form the eye color. Begin with the procedure for bringing energy to the hands and face. When your hands and face are hot, direct the chi to both eyes until you feel them filed with energy. 1.Close your eyes. Use your fingertips to gently massage your eyeballs through your closed eyelids, six to nine times clockwise then six to nine times counterclockwise. Then gently massage the area around the lids the same number of times. Be aware of painful spots and massage those places until the pain goes away. pay special attention to the inner and outer corners of the eyes. Massaging these points of the Gall bladder meridian will relieve eye ailments. However, when rubbing near the corners of the eyes, do not rub too hard , because you can make the corners of the eyes droop down. finish with rubbing the corners of the eyes upward. 2.Pull up the eyelids to increase the fluid. Use the thumb and index finger to gently pinch and pull up the eyelids, then release them. Do this six times. 4.The next step is to get a tear out of your eyes, which will strengthen them. Hold an index finger up about eight inches from your eyes (or put a dot on the wall five to six feet away from you). Stare at it intently without blinking until you feel like a fire is burning in your eyes The Taoists believe that this technique burns the toxins out of the body through the eyes. 5.Bring chi to your eyes by rubbing your hands until they are warm, then closing your eyes and covering your eye sockets with your palms. Feel the chi from the hands being absorbed into the eyes. 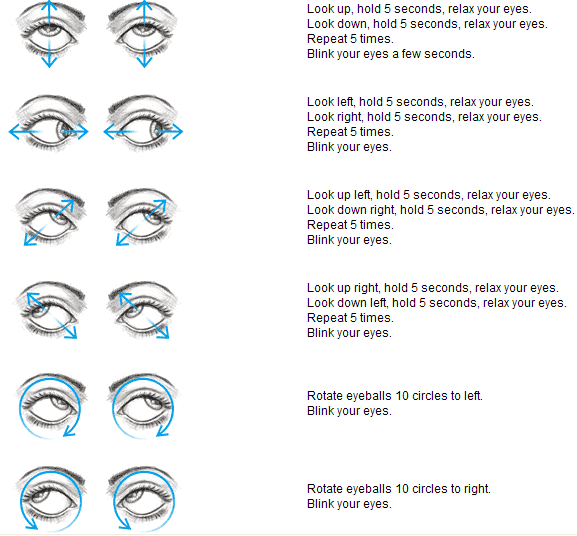 Rotate your eyes six to nine times, first in a clockwise direction, then counterclockwise. The eyes have many muscles that we typically do not exercise very much. This causes them to become weak, contributing to poor eyesight. In addition, the eyes are closely connected with certain organs and nerves. Exercising the eyeballs not only is the best exercise for the eye muscles but also will exercise these linked areas by putting pressure on them: Contracting the middle of the eyeballs strengthens the back of the eye muscles and the inner ear. Moving the eyeballs upward by looking toward the crown strengthens the upper eye muscles and stimulates the pituitary and pineal glands. Moving the eyeballs from side to side strengthens the side eye muscles as well as the ear canals, eardrums, tear ducts, and nose. Moving the eyes downward strengthens the lower eye muscles as well as the lower parts of the ear canals and the nervous system. The chrysanthemum has long been used in traditional Chinese medicine (TCM) for eye care. The flower is beneficial for correcting imbalances in kidney and liver function that is a cause of dry eyes, blurred vision, dizziness, spots in front of the eyes and excessive tearing. A warm infusion of chrysanthemum flowers may be helpful in relieving eyestrain, blurry vision, dry eyes and any eye issues in general. In addition, it is thought to help prevent and possibly reverse cataracts, according to the “The Green Pharmacy Herbal Handbook.” You can drink the tea or apply hot compresses for relief from aching, tired eyes. If you have the actual chrysanthemum blossoms, soak them in hot water for a few minutes and make a poultice by placing them between two pieces of gauze. 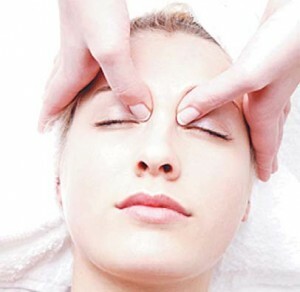 Place a poultice on each eyelid and relax for 10 minutes for relief from eye pain. 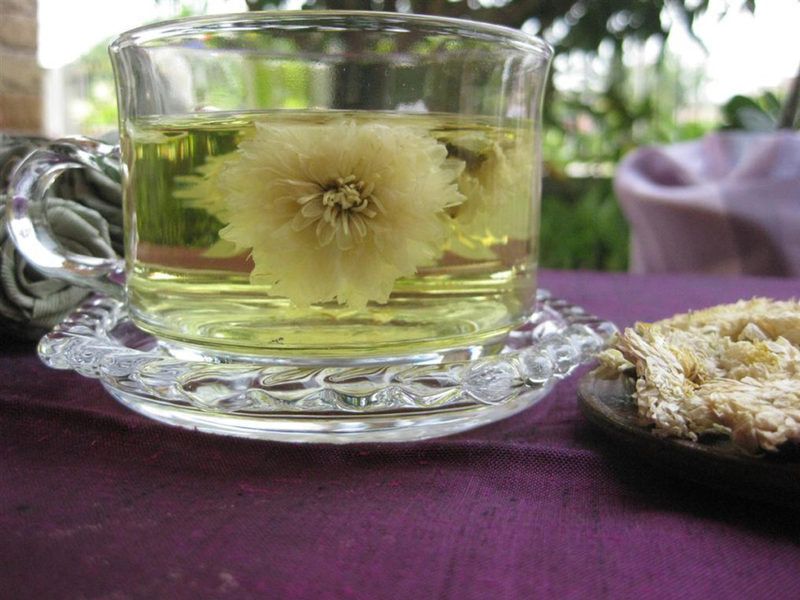 Speak to your herbalist or practitioner before using chrysanthemum for eye treatments. 1. Detoxifies the blood, helps with sinus congestion and regulates high blood pressure. It can also help to calm the nerves. 2. Restrains the growth of bacteria – like Staphylococcus aureus, Streptococcus hemolyticus B, Pseudomonas aeruginosa, Shigella dysenteriae, tubercle bacillus and dermatomycosis – in the body. 3. Brings relief against influenza and treats heatstroke, due to its cooling effect. 4. Facilitates digestion and apt after having greasy and oily foods. 5. Helps to strengthen lungs and relieve head congestion. 6. 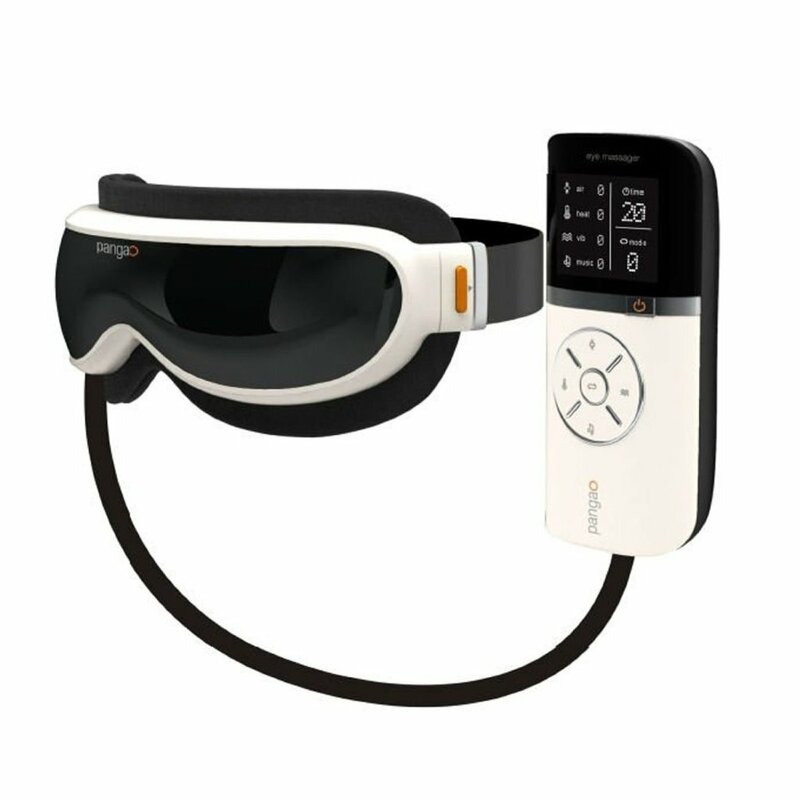 Improve vision and hearing and especially recommended for those who work long hours in front of a computer. 7. Good for obese people, as it contains zero calories, when consumed without adding sugar or honey. It also doesn’t contain any caffeine. 8. It also treats dizziness and acts as a stimulant. 9. It helps to cure pimples and fight acne. Lutein is an antioxidant carotenoid a pigmented nutrient that is responsible for the yellow colors of fruits and vegetables and is present in the highest quantities in dark, leafy green vegetables. You’re born with a certain amount of lutein in your eye, but your body doesn’t reproduce it. The macula is the region of the retina responsible for central vision. It’s also the area that is most sensitive to blue light, the part of the visible light spectrum that, along with ultraviolet light, can damage your eyes. Lutein helps protect against this damage by filtering blue light before it can damage the macula. * If sunglasses are the first line of defense against blue light, lutein is the last. Without adequate consumption, the amount of lutein in the eye may deplete with age. Leading doctors recommend you get at least 6 mg of lutein per day to help maintain proper eye health. Since your body doesn’t make lutein, you must constantly replace it through the foods you eat. Dark, leafy green vegetables like spinach or kale are especially good sources. But you’d have to eat over 2 bowls of raw spinach every day to get the recommended daily dose of 6 mg of lutein. Taking a multivitamin may help, but many multivitamins contain only a fraction of the recommended 6 mg of lutein. In fact, the leading multivitamin contains just .25 mg of lutein − a mere 4% of the recommended amount. The eyes have been referred to by many cultures as ” The windows of the soul.” According to Chinese medical theory, the eyes are the gate of the liver and are controlled by the liver system. The eyes are the bridge between the liver and the outside world. They are an outward expression of the health state of the liver. Hello and thank you from all of us at Isabel’s Beauty Blog. Your support is well appreciated, it helps us to continue to research and invite new contributors. We take the time to bring you quality information, products and authorities in the subjects we post. We wish for you, family and friends to enjoy and share, your choices with others. Here we are in the subject of water, the post would have been too long if we wrote al the information we gathered, so with that been said, we decided to do a few posts on this subject with the point of view of a few experts, enjoy. 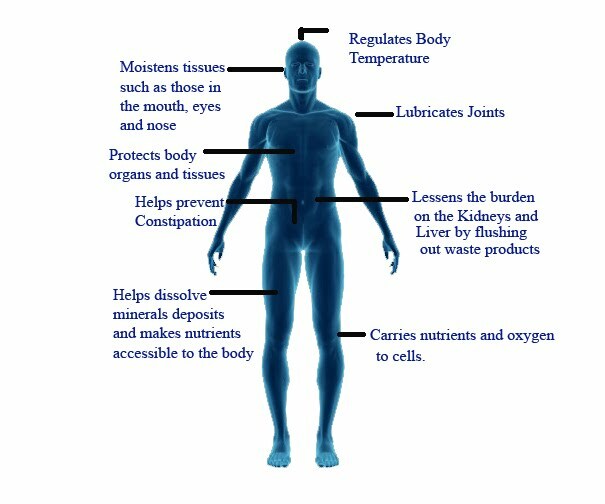 Water is the most abundant nutrient in the body, comprising two-thirds of the body’s mass. People make efforts to obtain unadulterated food but neglect to find water of similar quality. Every type of water has its own unique quality. Rain water tastes lighter, well water is more mineralized, river, lake, and spring water each has their own qualities. One of the most important principals regarding our personal water consumption I believe is listening to the wisdom of our body, and drinking accordingly to our own thirst. So often we are told drink 8 glasses of water a day and other recommendations that perhaps are not for every individual constitutions or needs, not to mention any reference to the quality of water and the temperature of it when consumed. If large amounts of water are ingested for reasons such as hard work or internal heat, is best done at least thirty minutes before or one hour after meals. Otherwise digestive enzymes and secretions are diluted, and food nutrients are not effectively extracted. When water is taken with meals it is best to drink small amounts and warm perhaps a warm tea is a great idea. 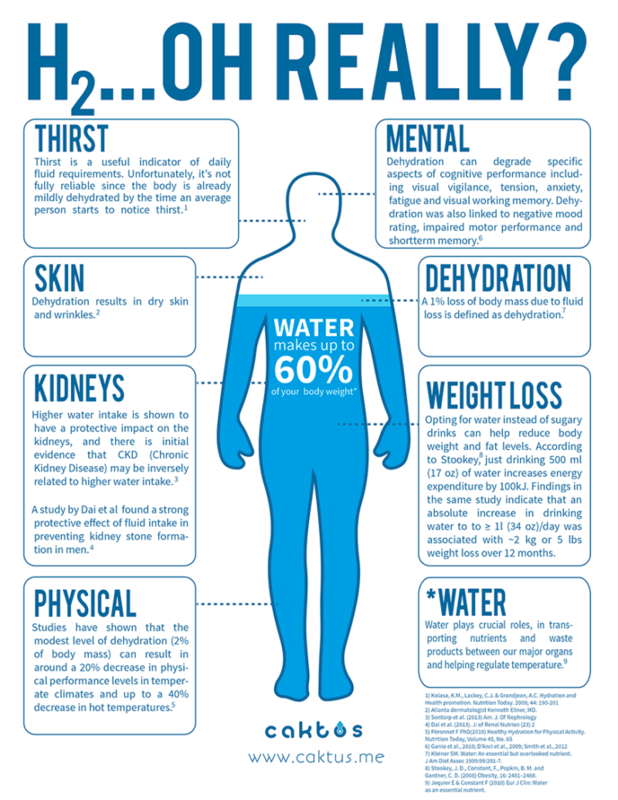 The optimal water intake varies widely, every persons requirement is different.Thirst is an important indicator of the need for water, this not always a conscious choice. In the other hand insufficient water consumption causes toxicity of the body as well as constipation, tension, tightness, overeating,inflammation, dryness, and kidney damage. 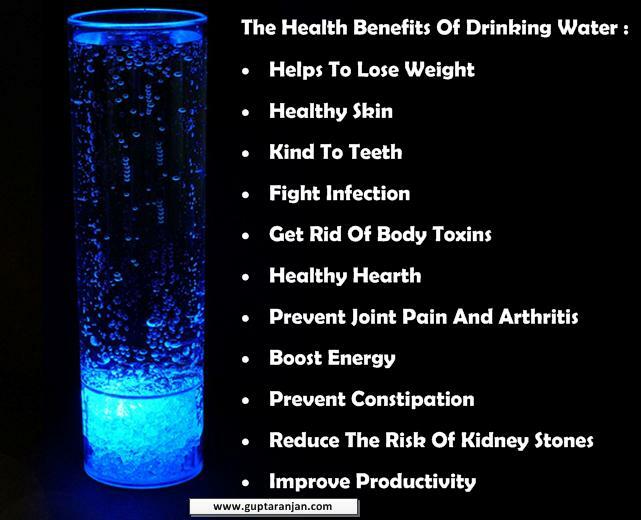 When drinking water it is recommended to drink slowly, this helps the body to absorb it better. Water is responsible for dissolving most of nutrients, minerals, and substances in the biological processes in human body. It transports the required amount of essentials to different parts of body and also provides a moist environment for our ear, nose and throat tissues. 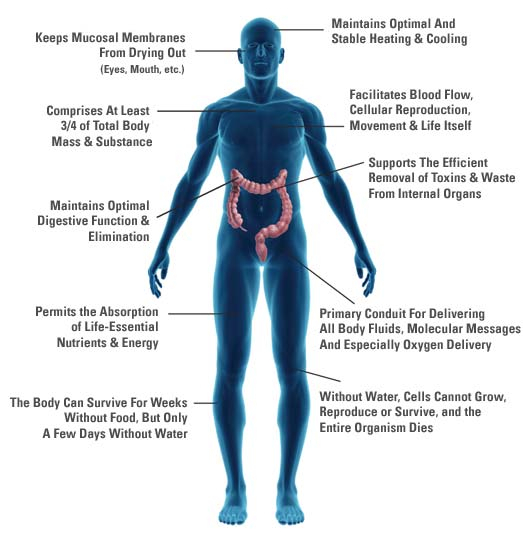 Water is also play a vital role in flushing waste and toxins out of bodies. The climate, where do you live? How is your health status? Does your activity make you sweat? Daily Water Requirements: Drink 50-75% of your body weight in Ounces (Oz). Note: This is only an estimate. This may very person to person. As per popular request, we are sharing the stretch marks post once again. So many people have this issue with their skin and here we have great tips and videos that definitely will help you. All you really need to do is have consistency, it works best when done on a routine basis. We wish you success in your project, and thank you for your amazing and consistent support, we do the work with the intention to make a difference and when we have your likes and shares it tell us we have done a great job. Stretch marks are visible lines on the skin surface, with an off-color hue. Stretch marks are mainly found in the abdominal wall, but can also occur over the thighs, upper arms, buttocks and breasts. Sometimes stretch marks can cover large areas of the body. While pregnancy is the main cause behind stretch marks, other reasons can be sudden gain or loss in weight, rapid growth, heredity factors, stress and changes in physical conditions. The skin consists of three main layers: Epidermis (the outer layer), Dermis (the middle layer) and Subcutaneous or Hypodermic (the deepest layer). 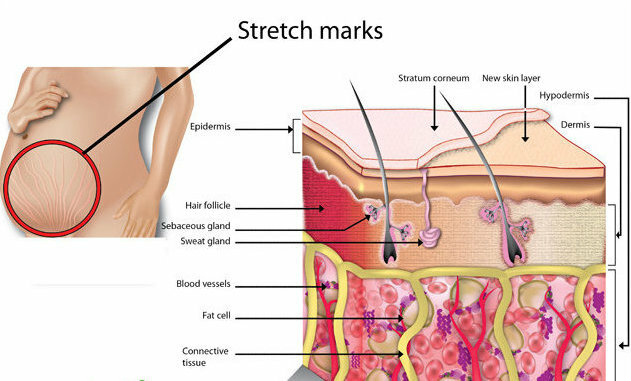 Stretch marks form in the dermis or middle layer of the skin when the connective tissue is “stretched” beyond the power of its flexibility due to rapid expansion or contraction of the skin. As skin is stretched, the collagen is weakened and its normal production cycle is interrupted and damaged. This ultimately results in fine scars under the top layer of the skin. Initially the marks look pink or red, but over time a thin, silvery line appears on the skin surface and a stretch mark is born. 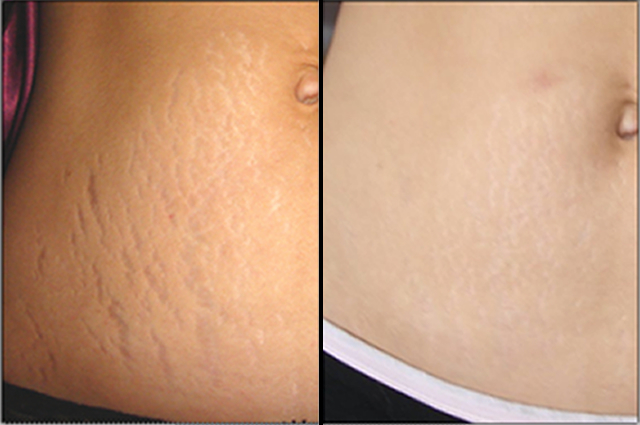 Stretch marks appear on the skin surface when someone grows quickly, or puts on weight quickly. Anti oxidants are compounds well known for keeping skin young. These compounds have properties which repairs our skin fast and helps you to get rid of wrinkles and stretch marks. Eat foods rich in anti oxidants or apply a stretch marks removal cream for lessening your marks. Catechin polyphenols in green tea, polyphenols in apples, flavonoid in dark chocolate, lycopene in tomato, gluthathoine in yogurt are good antioxidants to treat stretch marks. Other foods like berries, pomegranate, eggs are also very helpful. One can also apply these fruits and vegetables to your cracked skin so that it heals fast. Good quantity of anti oxidants in body will not only help you to get rid of stretch marks but will also keep skin firm. Eat food rich in Folic Acid, Vitamin C, Vitamin K, Zinc and omega fatty acid to help l the stretch marks. 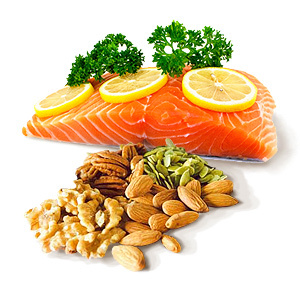 Fish, eggs, oranges, broccoli, spinach, almonds, lentils are foods one must have to provide body with essential nutrients to heal the cracks fast. Also drink water according to your body requirement, everybody is different, to keep body hydrated and moisturized. Junk food should be avoided in this process. Exercise provides more blood and oxygen to skin that helps to give extra nutrients and vitamins that repair the cracked skin. Remember to exercise more for the region or part of the body where you have more stretch marks. Usually the stretch marks are on chest thighs and stomach, so chest push ups and pull ups are good. Similarly for stomach crunches are good and for thighs cycling, swimming and sit ups are helpful. One can also massage the area where you have cracked skin. Take a cold pack and slowly rub in on your marksa. Follow this method daily to quickly remove stretch marks. Now a days many creams are available in the market that claim to lighten stretch marks from skin. Although we have not tried any such cream or not asked any person who has used such creams, but these companies claims to give postive results. You can ask a dermatologist for getting a quick solution to your problem. 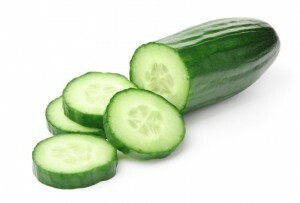 Cucumbers are various nutrients and skin lightening compounds that lighten the stretch marks. It provides a lot of moisture that leads to growth of new cells that repair the affected skin. Take the smaller cucumber and cut in into slices. Now take one slice and rub it slowly over the stretch marks for 5 minutes. Let it stay for 15 minutes, till then have some rest. Now remove the cucumber slice and wash the affected skin with warm water, apply an oil or a rich moisturiser . Cucumber helps to relax our skin cells and following this method daily will lighten your stretch marks quickly. Avocado is a great source for folic acid. Folic acid is widely used in stretch marks removal creams and is very good in healing damaged and cracked skin. Avocado also provides a lot of moisture to skin, hence extracts of avocado are widely used in moisturizing creams. 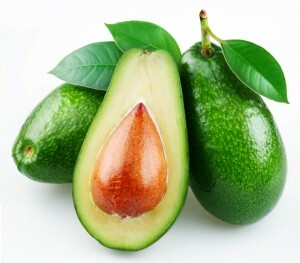 To prepare a natural stretch marks removal cream make a paste of avocado. Now apply it to skin and let it rest for 20 minutes. Now remove it using warm water,and proceed with an oil or a rich moisturizer. Follow this technique daily to get rid of stretch marks naturally. This will not only heal the skin but also make it soft and more flexible. You can add some lemon drops to avocado paste for getting better and more effective results. Aloe vera gel is rich in anti oxidants, moisture, vitamins and has powerful healing properties that help to treat stretch marks, wrinkles and various other skin problems. Since it is antiseptic , it can also be used to heal burns, rashes and cuts. Due to its nutritional skin benefits, it is widely used in skin care products. Apply aloe vera gel to your stretch marks and let it dry for 15 minutes, apply an oil or a rich moisturizer. This therapy will soothe your stretch marks and make skin soft and beautiful. Antioxidants in this gel repairs skin cells and stimulates the generation of new skin that quickly removes stretch marks. Potato contains starch, vitamins, minerals and skin lighting enzymes which makes it one of the best remedy for removing stretch marks. Potato speeds up the process of production of new skin cells that fill the cracks in skin. Crush one potato and extract its juice or cut in into big slices. Apply the juice or gently rub slice to your effected skin. I recommend you to apply the juice and cover it with cotton. Let it remain for fifteen minutes and then rinse it. 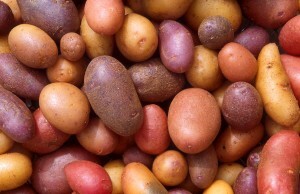 Allow the skin to absorb the nutrients from potato so that it speeds up the process of healing stretch marks. Honey and lemon juice treatment is also very effective to get rid of stretch marks. While honey is full of predigested sugar and moisture, lemon contains vitamin C and citric acid that lighten the skin marks. Vitamin C also builds collagen in body that repairs and lightens the dark spots and stretch marks. 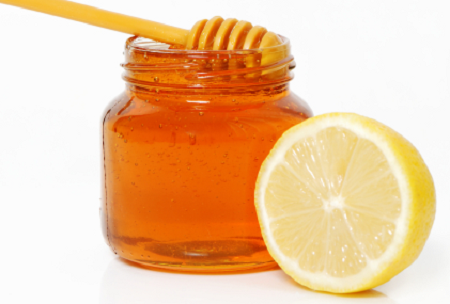 Add few drops of lemon juice to honey and cover your affected skin with it. Give time to the skin so that it absorbs the moisture, vitamin C and other compounds. Follow this process daily and within weeks your stretch marks will start fading. 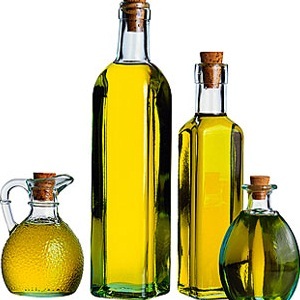 Natural oils like coconut oil, almond oil, olive oil contains vitamin E and lots of anti oxidants that helps to deal with various skin problems including stretch marks. Massage any one of these oils to your marks daily for 10 minutes. Giving more time will soothe your skin problem and repair your cracked skin faster. 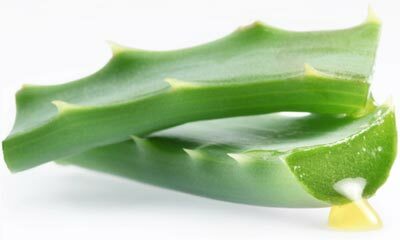 For better and quick results mix aloevera gel to one of the natural oil, apply it to skin and leave it overnight. 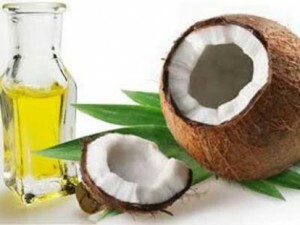 Coconut oil’s unique composition, including a variety of powerful antioxidants and fatty acids, makes it an outstanding source of nourishment for the skin when applied topically. It also contains lauric acid, a medium chain fatty acid whose only other natural occurrence is in mother’s breast milk- dermatologists suggest that coconut oil does for the skin what mother’s milk does for growing infants. As both coconut oil and vitamin E are readily available at supermarkets, blend the two to reap maximum benefits. Apply the oil to clean, dry skin twice daily and allow to absorb. Store unused oil in a cool, dark container for future use. Eating vitamin E rich foods is beneficial for the same reasons as its topical application- vitamin E is outstanding at protecting against free radicals and nourishing skin cell membranes. Vitamin E rich foods include sunflower seeds, almonds, leafy greens, asparagus, and papaya among others. Zinc is necessary for the production of collagen, which gives skin it’s elasticity, as well as an essential part of the functioning of enzymes that repair damaged tissue in the body. Foods rich in zinc include sesame seeds, pumpkin seeds, oats, yogurt,seaweed, oysters, etc. In The Green Beauty Guide, Julie Gabriel suggests a mixture of salt, honey and glycerin to get rid of stretch marks. Stir together 1/2 teaspoon salt, 1 teaspoon honey and 1 teaspoon glycerin in a small container; then massage onto skin for a few minutes and rinse. Afterward, wash with a gentle cleanser, moisturize (with the oil blend from above) and pat dry. Store unused scrub in the refrigerator and use within 48 hours. Egg is rich in omega 3 fatty acids, proteins, vitamins and minerals that help to get rid of wrinkles and stretch marks. 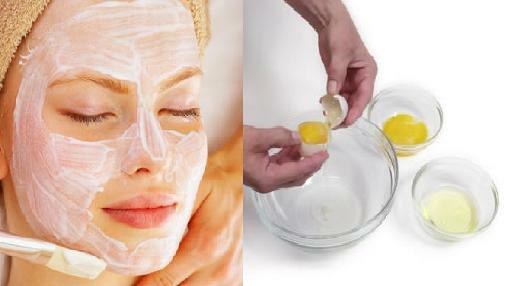 Apply the egg white to your skin, let it dry and wash it after 10 minutes. This remedy is helpful for healing stretch marks easily. Milk cream is the great source for many vitamins and minerals that helps to nourish our skin cells. Apply the milk cream directly to your skin, leave it for 30 minutes. Giving more time will help the milk cream to erase your stretch marks rapidly. Follow this method daily and within one month you will get positive results and your stretch marks will be less visible. Orange juice is rich in vitamin C that works best for treating stretch marks and lightening skin tone. Mix little turmeric and olive oil to orange juice and rub it over your stretch marks two rimes a day. Follow this technique to fade your stretch marks quickly. Click the links below for great stretch marks products. The entire Mad Hippie advanced skincare lineup for one low price! Includes Face Cream, Eye Cream, Cream Cleanser, Exfoliating Serum, and Vitamin C Serum. Get three essential Mad Hippie products for one low price! Kit includes the Face Cream, Eye Cream, and Vitamin C Serum. Eminence Organics Biodynamic Echinacea Recovery Cream (1oz) restores balance to problematic skin types with an infusion of moisture, vitamins, and healing agents that revives and rejuvenates tired complexions. Perfect for treating oily, acne-prone skin, this facial treatment cream reduces the redness associated with active acne lesions and promotes the skin’s natural healing process to quicken recovery from breakouts. 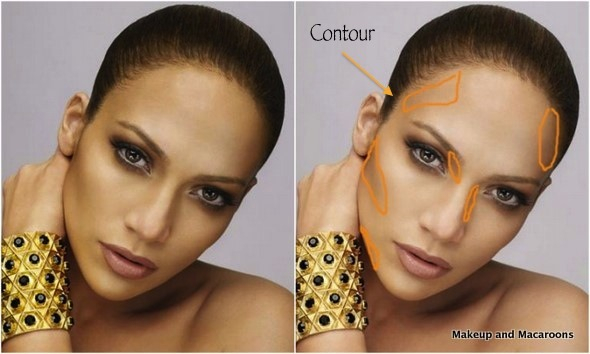 The tricks of makeup contouring as a gift for you. WOW! the support this past week has been tremendous. We are so thankful for your help, it means so much to us, it is what keeps us going.We have a new addition to our team, her name is Marie Mannino and she is in charge of the Social Media, she is amazingly good at her job, we are very thankful to have her. This post is about highlighting and shading, we are sharing a few different perceptions and techniques and different videos from contributors that are very gifted. Enjoy and share with others and don’t forget to click like . Is the opposite of contour. Highlighting is the process of enhancing; visually enlarging, drawing attention to a specific area, a feature highlight shade is usually a lighter shade. Contour is the opposite of Highlight. Everything that we contour we push away from the eye to make it appear less visible, in other words to minimize or give the illusion that is smaller. 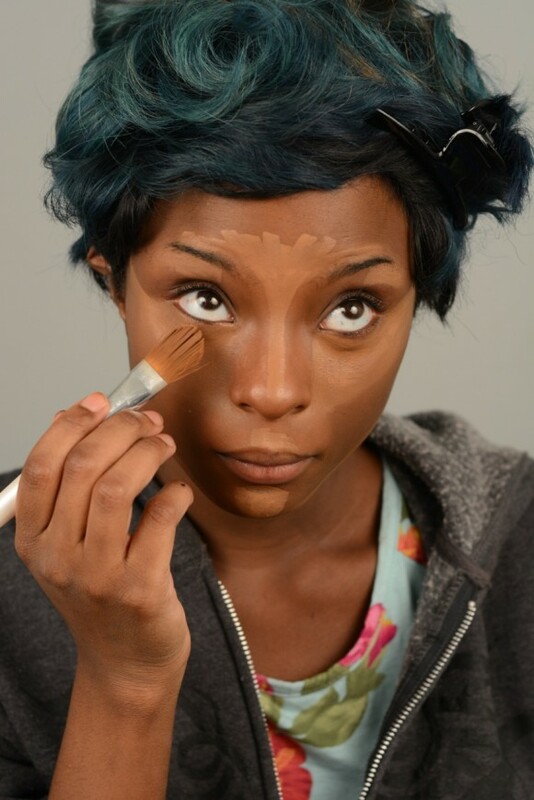 A contour shade is usually a darker shade that give your features more depth and definition by contrasting against the lighter shades used on your Skin. 1. Prep your face with two shades of base. “Dot on a foundation that’s one shade lighter than your skin tone in the center of your face, and another that’s one shade darker than your complexion around the perimeter,” . Our model Jess used IT Cosmetics Bye-Bye Under Eye Concealer in “Natural Medium” (as the light base) and “Deep” (as the dark). 4. Blend the two for a flawless finish. “Create that sculpted airbrushed effect using a flat top dense brush to buff out the two shades to perfection,” . Here,is used IT Cosmetics Heavenly Luxe Flat Top Buffing Foundation Brush. Lastly, bump up the contours and highlights with MAC Sculpt and Shape Powders and consider yourself contoured!,here is used “Definitive” to enhance the contoured areas on your face and “Emphasize” to illuminate the highlighted spots. 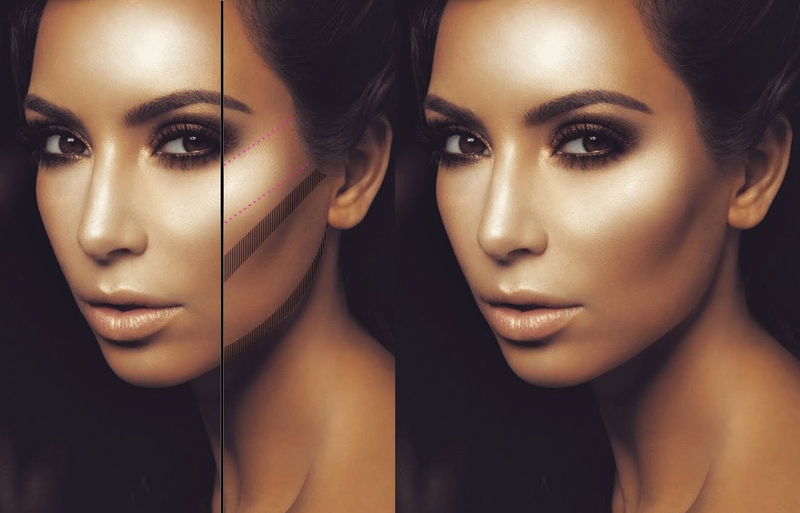 Highlighting and contouring are two crafty li’l tricks that you can use to enhance your bone structure and make it look like you’re constantly under the most flattering movie lighting possible. Even if you’re not going to an event, it’s fun to experiment with elements of ~drama~ in your makeup. 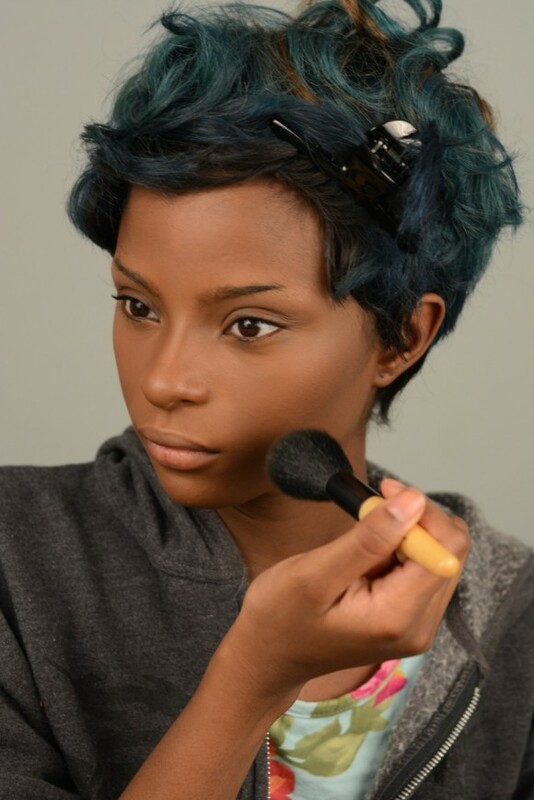 This tutorial will show you how to use foundation, concealer, and powder to put a spotlight on your natural gorgeousness. Let’s get to it! A powder brush such as this kabuki brush from Claire’s. Optional: a foundation brush or sponge like this one from e.l.f. Optional: a concealer brush like this one from e.l.f. 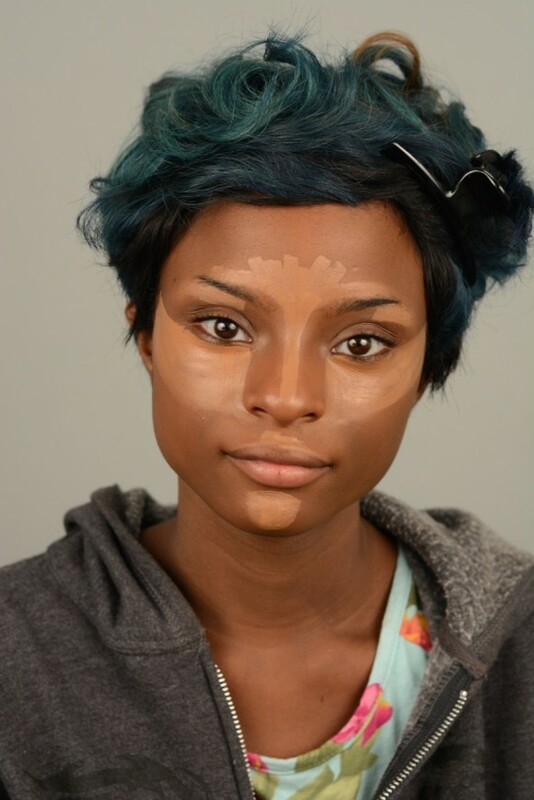 A note on picking your contour and highlight colors: Don’t choose shades that are drastically lighter or darker than your natural skin tone. 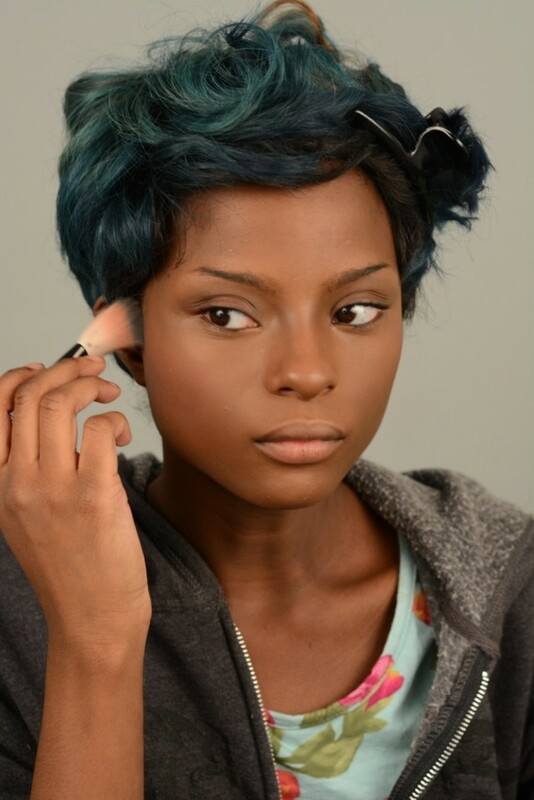 If you have fair skin, use a very light shade to highlight and a fair to medium color to contour. 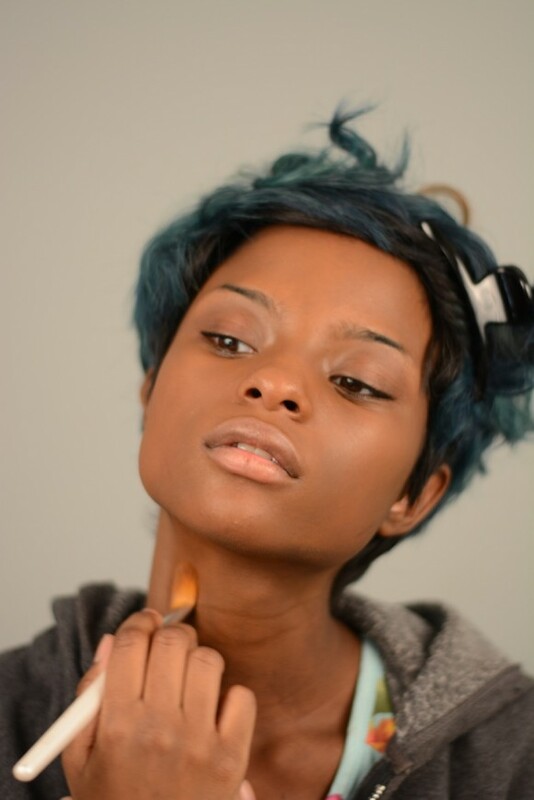 If you have darker skin, use a medium-toned highlight and a contour slightly deeper than your skin color. If you have very dark skin and can’t find a deeper shade of foundation to contour with, a dark eye shadow will do the trick! 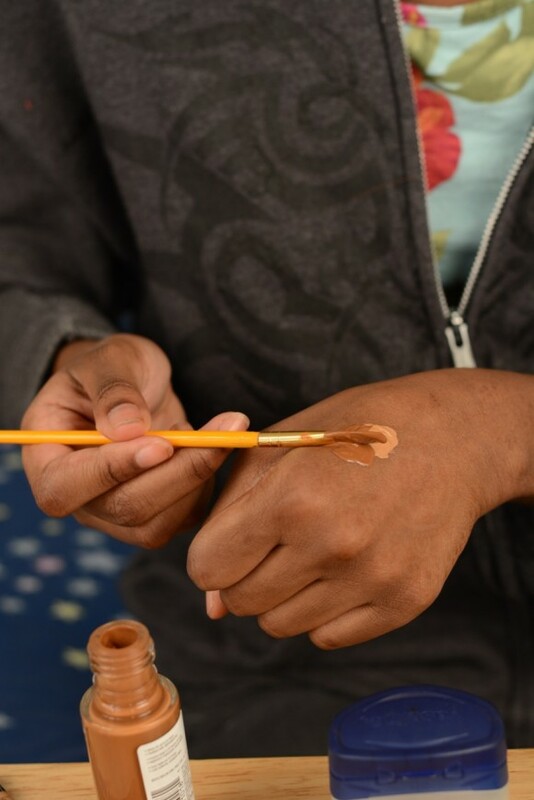 After cleaning and moisturizing your skin, apply your foundation all over your face using a foundation brush or your fingers. Blend your foundation to about midway down your neck. Since my skin is naturally darker there, this step makes the difference between my face and neck less stark. 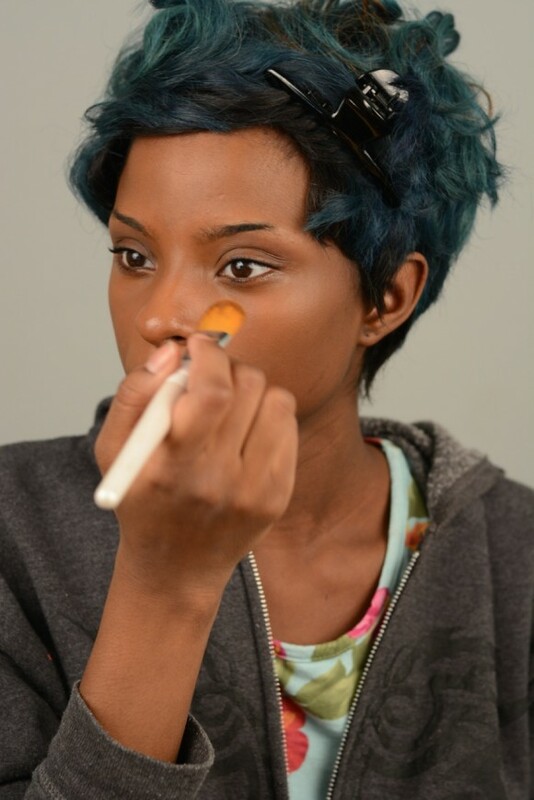 Mix your lighter concealer or foundation with your regular foundation using a brush or your fingers. Using a concealer brush or your fingers, apply the lighter makeup mixture to your T-zone (the area right above your eyebrows and the spot between them, if you have one; down the center of your nose; the middle of your upper lip; and the middle of your chin), your under-eye area, and right above your cheekbones. 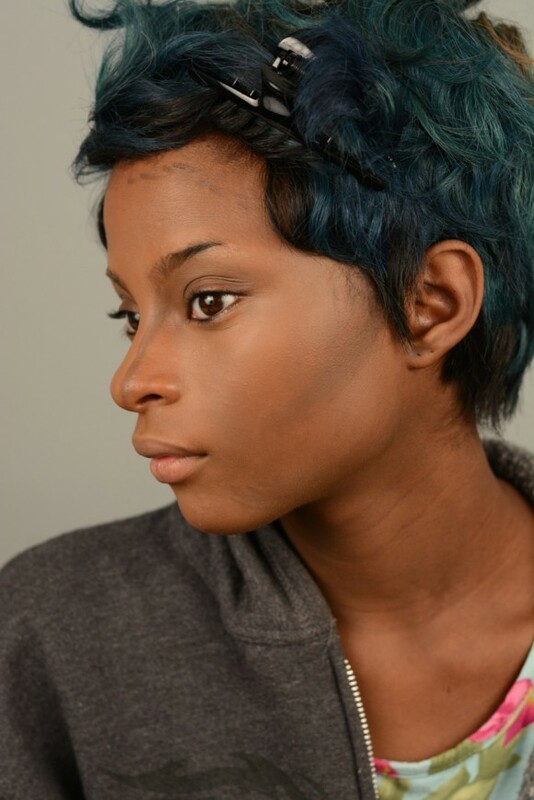 Paint a thin line with this highlighting mixture right above your jawline. Use a brush, sponge, or your fingers to blend your makeup until there is no visible line of demarcation between the highlighter and your foundation. You want this to look seamless. 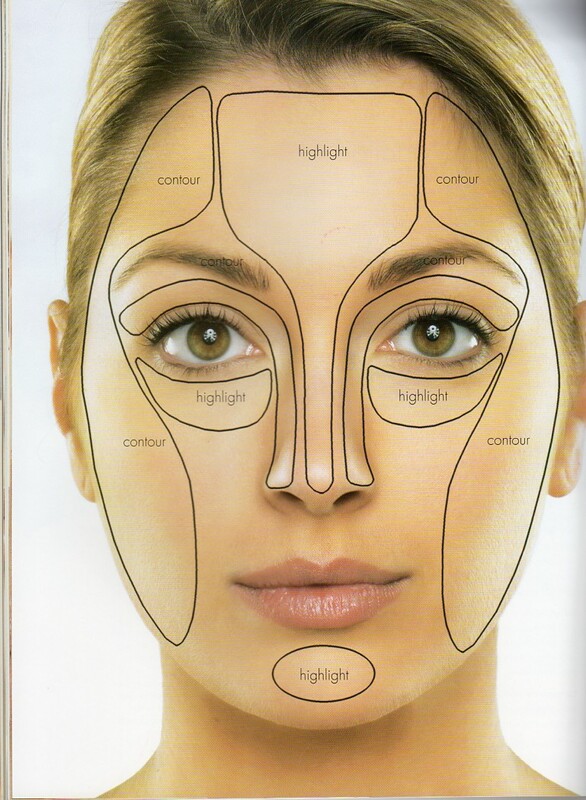 The “contour,” or darker makeup, goes on the sides of your nose, right under your cheekbones, and around your hairline (the darkest areas on the diagram above). Blend in your contour just like you did your highlight. Easy, right? Apply finishing powder to your whole face to get rid of any excess shine and set your makeup. Add blush to your cheeks, moving upward from the apples to your temples. This will add dimension to your face and give you a pretty glow. Wow! You’re all set. Now go astound the world with your flawless skillz! 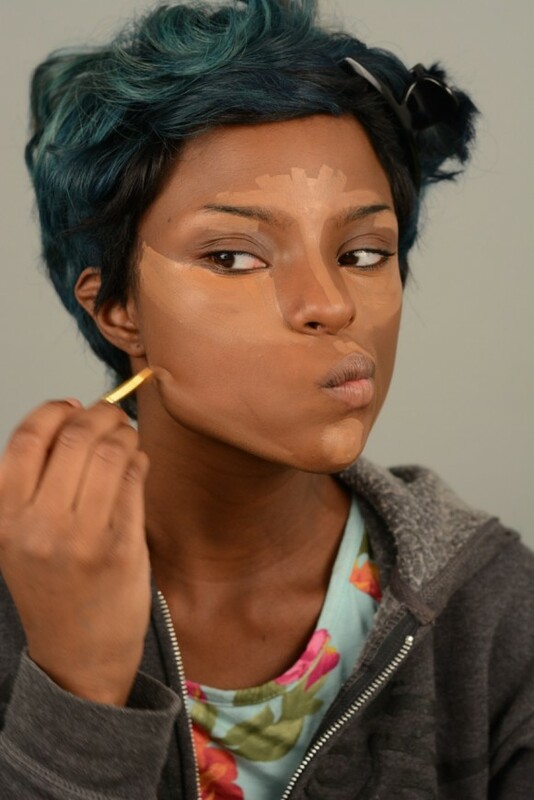 HOW TO: CONTOUR AND HIGHLIGHT YOUR FACE! Become your own makeup artist with the Studio Deluxe Favorites Gift Set. The ultimate gift set for any makeup lover on your list, complete with all the must-have professional makeup and accessories you need to achieve flawless looks this season. Originally $54, grab this set now for $50 – an amazing value! Was $25, Special Holiday Price only $15! Enjoy this gorgeous, sleek mirrored palette, featuring 50 bold shades for eyes and face! Switch up your look fast, like a professional makeup artist, and create day-to-night looks with ease. Brighten and define your eyes, while sculpting and contouring your face, creating a beautiful look every time. This palette also makes an incredible gift for any makeup lover! Was $93, Now $75 – You Save 20%! This 25 piece Complete Professional Brush Collection is the ideal brush set for any makeup artist at heart. Each top-rated Studio makeup brush is designed and tested by a team of makeup artists to provide precision application every time. The 25 piece set includes everything you need to create a flawless finish, plus our Makeup Artist Brush Belt to store and organize your brushes right where you need them.